We have been going to Yama Sushi for a long time and it’s our favourite. The food is delicious and the family that owns it is wonderful. I always order the rocky mountain roll, which is way too big, but I love all the crispy tempura bits on it. Oh yum, I’m a big fan of the crispy tempura bits that come with some sushi too. 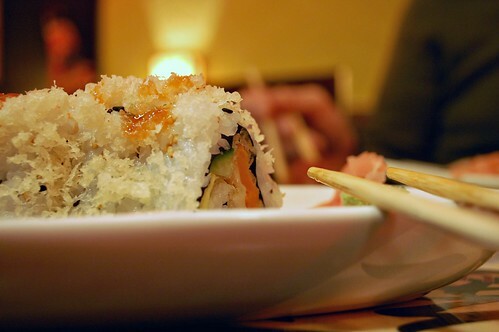 My fav is spicy tuna (it has the bits too – yah!). Oh and I also love Dragon Roll (more bits in that too)… suddenly craving sushi. Oh, I’ve never been to this one! One more for the list! Yum! Just the other night We were just wondering where the good sushi spots are in the neighborhood – I have a feeling we may be trying this out very shortly.